A Numbered limited-edition collector plate trimmed with 23kt gold. "Sunflower" is a magical rabbit; her golden beauty is a gentle reminder of the infinite possibilities that lie within us all. 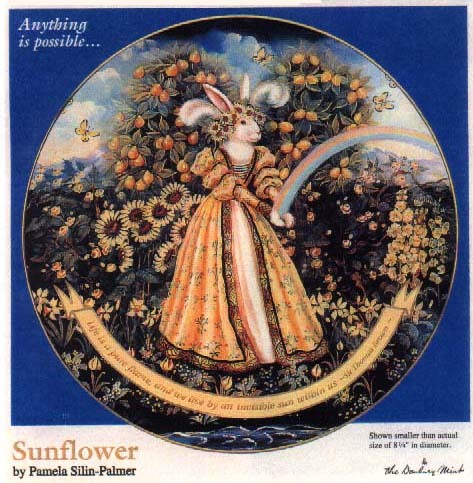 The first of Pamela Silin-Palmer's Rabbits of the Rainbow, she is the keeper of our deepest wishes, weaving wish flowers into garlands and sending them back to us on the wings of butterflies. Now, the exquisite creation of this talented artist is available exclusively from the Danbury Mint on a limited-edition porcelain collector plate. "Sunflower" is limited to an edition size of 75 firing days. The border of each hand-numbered plate, as well as the inspiring message, will be decorated with 23kt gold. In addition, each plate comes complete with a Certificate of Authenticity.